David White was born in Denver, Colorado, on April 4, 1916, and received his dramatic training in the 1940s at the Cleveland Playhouse, the Pasadena Playhouse, and Los Angeles City College. After serving overseas with the Marine Corps for twenty-eight months during World War II, David spent the early postwar era appearing in stage productions of Home of the Brave, Command Decision, and State of the Union. Shortly thereafter, he landed his first major Broadway role in Leaf and Bough. He played a smalltown drunk with two sons, portrayed by Richard Hart and Charlton Heston, who was only eight years younger than David. The play was a critical failure and ran only two days. David's performance, however, was impressive, and he went on to more successful Broadway productions, including The Bird Cage, Anniversary Waltz, and Romeo and Juliet. His film highlights include Sweet Smell of Success (1957), The Apartment (1960), Sunrise at Campobello (1960), The Great Imposter (l961), and Madison Avenue (1962), the latter two titles of which seemed to foreshadow his role as Darrin's New York boss on Bewitched. White appeared in several TV dramas, including Studio One, Kraft Theater, Playhouse 90, and The Untouchables, where he worked with Elizabeth Montgomery in an episode entitled "The Rusty Heller Story". After Bewitched, White made numerous guest appearances in series TV, including The Rockford Files, Rhoda, Phillis, The Mary Tyler Moore Show, Quincy, Remmington Steele, and Cagney and Lacy. His later stage productions included a role in Savages at the Mark Taper Forum in Los Angeles, Enemy of the People (at the Seattle Repertory), and Catholics (at ACT, Seattle). To pay the rent before his acting career began to flourish, David worked as a farmer, a truck driver, and an executive doorman at the Boxy Theater in NewYork. He was for a while employed by the J. H. Taylor Management Company, also of New York, and was offered a very prestigious management position. He responded with a very pleasant, "No thank you, sir, I'm going to be an actor. And that he was, and a mighty fine one. White was married to the late actress Mary Welch, who once appeared with her husband on stage in a tour of Tea and Sympathy. She also played Charity Hackett in Samuel Fuller's movie version of Park Row (1952), and enjoyed a large variety of television credits. David had one son, Jonathan White (who died in an airline accident in 1988) with Mary Welch, and a daughter, Alexandra White (from a second marriage with Lisa Figus). 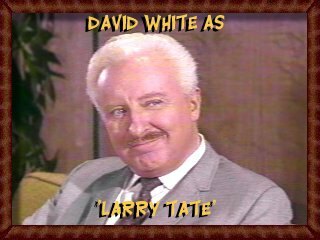 David White passed away November 26, 1990.